Compact yet incredibly rugged, the VX-150 2-meter handheld is derived from our Vertex commercial transceiver line, providing exceptional receiver performance along with clean, clear transmit audio. Built to withstand the rigors of outdoor use, the 16-key VX-150 is constructed inside a die-cast aluminum housing, with a large, high-output speaker delivering commercial-grade audio. And the illuminated keypad provides easy viewing during nighttime operation. You need a radio that's as tough as your operating environment; compare the features of the VX-150 to other handhelds, and you'll see that there is no comparison! 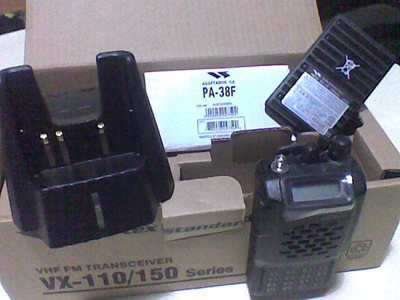 The VX-150 includes a 16-key keypad, providing both direct frequency entry and fingertip DTMF control on transmission. And a 9-memory DTMF autodialer allows simple access to autopatches or Internet Linking nodes such as the Yaesu WIRES-II system. The VX-150 puts out a maximum of 5 Watts of clean power, with selectable power-saving choices of 2 Watts and ½ Watt also being available with the touch of a front panel key. The versatile memory system of the VX-150 includes a total of 209 channels that can store frequency, CTCSS/DCS information, repeater shift, and a 7-character alpha-numeric label to aid in channel recognition. For operation in narrow-band channel situation, the VX-150 includes both Wide and Narrow deviation selection capability, to ensure compatibility with local operating requirements. The VX-150 is tested to meet the exacting requirements of MIL STD 810C/D for shock and vibration. Among the most rugged Amateur hand-helds ever created, the VX-150 is ready for action in the most challenging operating environments!